As you may have noticed, we’ve been getting a lot of our recent cooking inspiration from you. In the same autumn salad contest that prompted Merrill’s post on Persimmon Chiffon Pie, there were a couple of dressing recipes that incorporated caramelized fruit. I like citrus-based vinaigrettes but sometimes the flavor is too thin, too faint and ephemeral. So I decided to try caramelizing some citrus before squeezing the juice for the dressing. I sliced a tangerine across its belly, dipped one half in raw sugar, then pressed it into a very hot pan. It sizzled and bounced like a soft-shell crab in butter, and when a rim of caramel formed around the edge, it was done. For the vinaigrette, I whisked in a dab of Dijon, a splash of white balsamic vinegar and a shot of olive oil. Turns out: eureka! The pale sweetness of the tangerine was enriched by the caramelization, giving the dressing both body and depth. This new trick also worked with pink grapefruit, although I altered the dressing proportions slightly. There was no need for another acid like vinegar and I did add a pinch of sugar to the dressing to offset the grapefruit’s bitterness. Not everyone will notice the difference in a salad dressed with one of these vinaigrettes, but you will. 1. Set a small sauté pan over medium high heat. Do not use cast iron. Dip the cut side of each tangerine half in the raw sugar – you want a light but thorough coating. When the pan is hot, press the sugared side of the tangerine onto the surface of the pan. Let bubble and sizzle until caramelized; keep a close eye, you don’t want them to blacken. Remove the tangerine halves to a plate. 2. When the tangerine halves are cool, squeeze their juice into a bowl. Measure out 1/4 cup and pour this into a small bowl. 3. Whisk in a pinch of salt, followed by the mustard and vinegar. Slowly whisk in the olive oil until the dressing is emulsified. Taste and adjust seasoning -- if you want more acidity, add a little fresh lemon juice or more white balsamic. 1. Set a small sauté pan over medium high heat. Do not use cast iron. 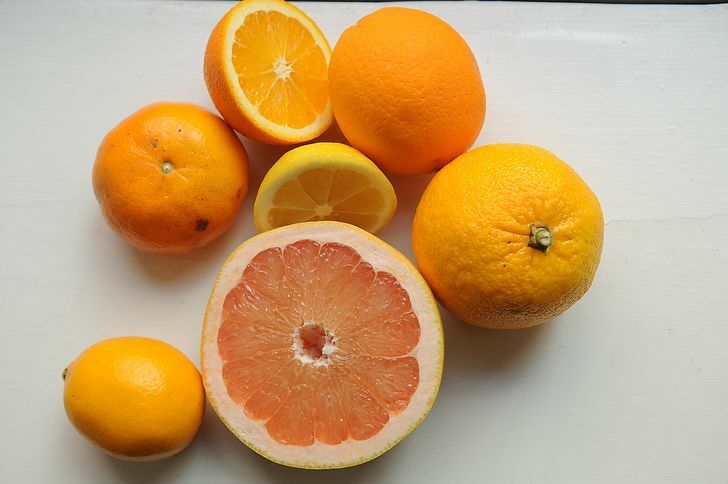 Spread the sugar on a plate and press the cut side of 1 grapefruit half in the raw sugar – it should fully coat the surface; eat the other half. When the pan is hot, lay the sugared side of the grapefruit in the pan. As the sugar melts and browns, the juices will bubble around the edge; don't let it blacken. Remove the grapefruit half to a plate and let cool. 2. Squeeze the juice from the grapefruit over a strainer and into a bowl. Measure out 1/4 cup and pour this into a small bowl. 3. Whisk in pinches of salt and sugar, then the mustard and vinegar. Gradually whisk in the olive oil until the dressing is smooth and thickened. Taste and adjust seasoning. I'm always looking for a new twist for my vinaigrette, and these variations sound terrific, great idea. I've been eyeing pomelos in the Asian market...wondering how that would work? Another question..do you think this would work if you have already zested most of the peel? Trying to use every edible inch of my ingredients..and thinking about candied pomelo zest + caramelized pomelo vin as beginning and end of lovely citrusy meal. Seems worth a try with pomelos -- esp love your idea of combining candied zest with the caramelized fruit. And I think it's fine if you've zested the peel! Thanks for sharing, this looks fantastic. This reminds me of a dessert my grandmother used to make us, she would slice an orange or grapefruit, sprinkle each half with sugar and roast it in the oven for a few minutes. Next time I do this I'll trying juicing one for a vinaigrette. I love grapefruit sugared and broiled. My grandmother made broiled grapefruit, too. She poured homemade blueberry syrup over it before popping it under the broiler. Alas, tangerines, grapefruits, and oranges are out for me, but I'm going to try this with Meyer lemons. Thanks for sharing this! I wanted to try it with Meyer lemons, too -- if you make it, let me know how it goes, and I will do the same. Oh, this is nice. I had a fairly juicy Meyer lemon, so I didn't add any additional acid, and I used 1/2 teaspoon of Dijon to give it a little more body - ended up with 1/2 cup of vinaigrette total. I'm having it on a salad of baby winter greens, roasted golden beets, Great Hill blue and pistachios. Yum. Amanda, great idea, never did it this way. Will certainly try the tangerine, I love the flavour. Thanks for sharing. Great idea! Sometimes I grill lemons before using in a vinaigrette or serving with fish but I never thought of caramelizing. I'm going to try the clementine version tonight with a simple green salad (mixed greens and fennel). I'll report back or blog about it! Your salad with grilled lemon dressing was one of the recipes that inspired this post (another food52-er did a recipe with, I think, caramelized apple in the dressing) -- so thank you! Let me know what you think. I should have noted that (and will) because clementines are smaller than tangerines. Also, that's why I add the white balsamic, to add a harder edge of acidity. But you could mix lemon and clementine -- I didn't do it because I caramelized a lemon and found it too bitter. But maybe the caramelized clementine with some fresh lemon juice?